UN Photo/Cia Pak | Marc-André Blanchard, Chair of Delegation and Permanent Representative of Canada to the UN, addresses the seventy-third session of the United Nations General Assembly. 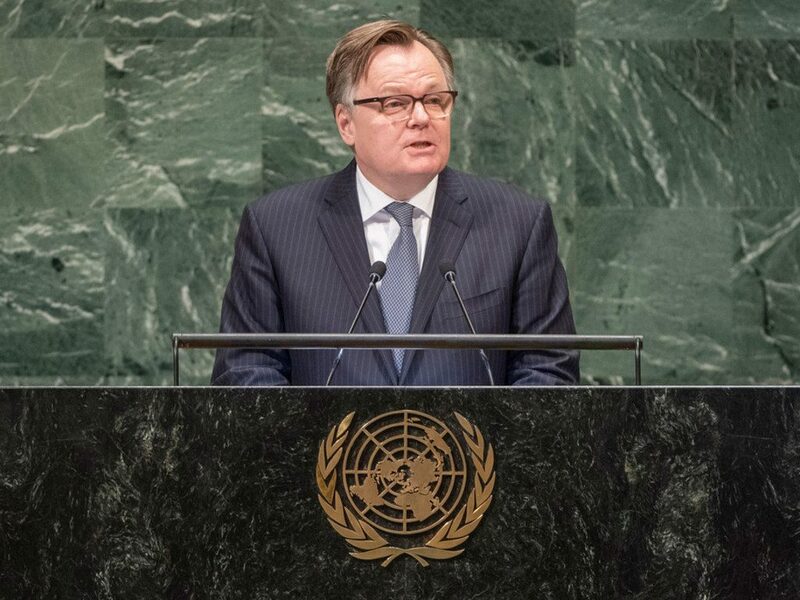 Addressing world leaders at the Assembly’s annual debate, Marc-André Blanchard, chair of Canada’s delegation called on the international community to find opportunities amidst challenges it confronts. “To harness this opportunity, starting with the most vulnerable, small island States, we must all work together with scientists, multilateral institutions, regional banks, investors, and civil society like never before,” he urged. In his address, the Canadian official spoke of the priorities of his country’s G7 presidency, including its focus on strengthening climate resilience and disaster recovery. He went on to inform the General Assembly of the North American nation’s participation in UN peacekeeping efforts, highlighting the “Elsie Initiative” – a practical plan to double the number of women in peacekeeping operations. “We know that having women in the ranks – and in charge – makes peacekeeping more effective and its results more durable,” said Mr. Blanchard. Turning to crises around the world, the Canadian official reiterated that his country’s actions remain guided in its commitment to protect and promote human rights, citing a recent unanimous motion adopted by Canada’s parliament calling on the Security Council to refer crimes against the Rohingya people to the International Criminal Court (ICC). Concluding his address, Mr. Blanchard announced Canada’s candidacy for a non-permanent seat on the Security Council for 2021-22, recalling the country’s “proven record” of working with other UN Member States to new ideas and approaches to tackle complex problems of international peace and security. “If elected to the Security Council, we will bring to bear our longstanding dedication to peacekeeping, our over thirty years of service as Chair of the UN’s Special Committee on Peacekeeping Operations, and our active membership on the Peacebuilding Commission,” he said.